This oddity uses C.B. 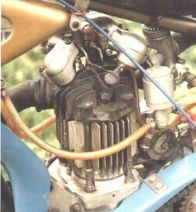 ignition rather than the magneto and please note the unusual Vertical Ribs on the cylinder as used by Gottfried Schwarze(Germany) in Longtrack Racing. Bryan Lambert came across a machine with similar type finning, before seeing this particular page. He thought perhaps it originated from an Aermacchi, and that as they came up to 350cc, he thought this could such a motor. We have already discovered that this similar type of barrel is used by Gottfried Schwarze in Longtracking, but if there is anyone who can possibly shed more light on this particular arrangement of the fins, we sure would like to hear more about it. Below are two colour pictures* of the machine Bryan refers to, and although difficult to see, it would appear that this particular machine could also be fitted with contact breakers, and is possibly of the same motor or type of motor. is not unique.